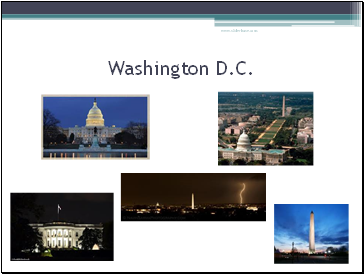 Washington D.C. is the capital of the United States. 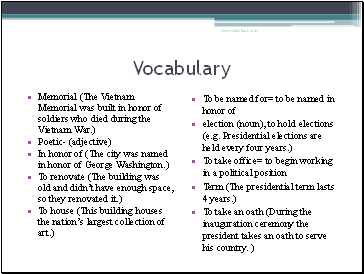 It was named in honor of the first president of the United States, George Washington. It is a special district and is not located in any state. The district is named “Columbia” because it is a traditional poetic name for the United States. 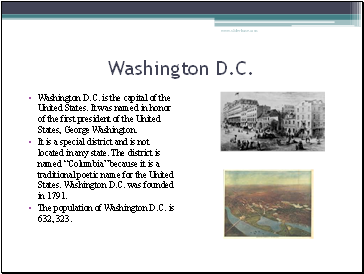 Washington D.C. was founded in 1791. The population of Washington D.C. is 632, 323. 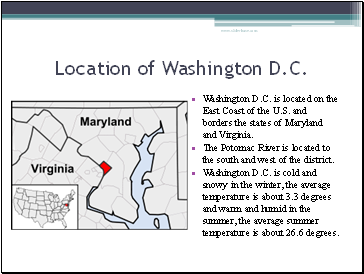 Washington D.C. is located on the East Coast of the U.S. and borders the states of Maryland and Virginia. The Potomac River is located to the south and west of the district. Washington D.C. is cold and snowy in the winter, the average temperature is about 3.3 degrees and warm and humid in the summer, the average summer temperature is about 26.6 degrees. All three branches (divisions) of the U.S. government are located in Washington D.C. The executive branch, the President of the U.S., lives and works in the White House. 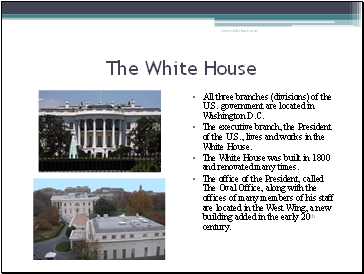 The White House was built in 1800 and renovated many times. The office of the President, called The Oval Office, along with the offices of many members of his staff are located in the West Wing, a new building added in the early 20th century. 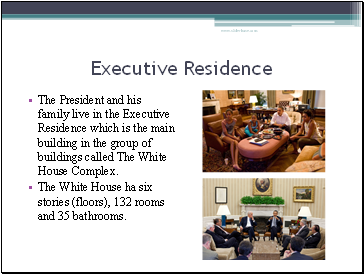 The President and his family live in the Executive Residence which is the main building in the group of buildings called The White House Complex. The White House ha six stories (floors), 132 rooms and 35 bathrooms.